In December 2015, bird lovers were greeted with sobering news: a University of New South Wales study found that the number of waterbirds in eastern Australia had fallen to the second-lowest level on record. Around 60 percent of wetlands surveyed were dry and the number of breeding waterbirds was the lowest ever recorded. The findings were ominous: as study author Professor Richard Kingsford noted, the low waterbird numbers recorded were partially due to drought conditions, resulting in birds dying or failing to breed. Worse news, however, was that breeding rates had been down since 2011–12. This continues the trend of a collapse in waterbird abundance since the 1980s of 80 percent, as explained by Professor Kingsford in BirdLife Australia's 2014 report Birds of the Murray-Darling Basin. In Victoria, the western and northern parts of the state were dealing with prolonged dry conditions. Water storage levels across northern Victoria were on average 35 percent lower in June 2016 than a year previously. Western Victoria experienced some of the driest conditions on record, with allocations for the Wimmera and Glenelg systems ending the year at just 16 percent. Both the Wimmera and Glenelg rivers were reduced at times to chains of pools. Positively, environmental water managers were hard at work watering wetlands, primary habitat for Australian and migratory waterbirds. Aside from the four icon Living Murray sites—Barmah Forest, Hattah Lakes,Lindsay Wallpolla and Gunbower Forest—12 wetlands were watered in the lower Murray, six in north-central Victoria, five in the Goulburn-Broken area and 40 small wetlands in the Wimmera-Mallee area. Further south where conditions were not as dry, the lower Barwon and Latrobe wetlands, both very important for birdlife, continued to receive restorative drinks. The watering provided a mosaic of habitat in what was (in the north and west of the state) an otherwise extremely dry landscape. As intended, birds flocked to the sites to feed and breed. Many rare and threatened species were observed including three egret species (great, intermediate and little) and the very shy and endangered Australasian bittern. "Environmental watering is critical for birds in dry times," says Paul Sullivan, Chief Executive Officer of BirdLife Australia. Paul heads up the nation's largest organisation devoted to the future of native birdlife. For over 100 years, members of BirdLife Australia have been powerful advocates for native birds and the conservation of their habitats, working to address the threats to vulnerable bird populations. It sees climate change, and the extreme weather patterns associated with it, as one of the key risks and considers environmental watering can be a mitigating factor. 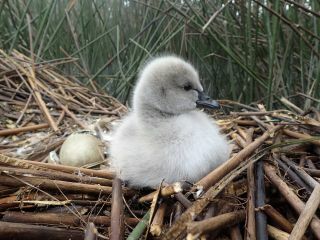 "Habitat is vital for waterbirds to survive and breed," Paul says. "With the flows of so many rivers now regulated with dams and weirs and with so much water extracted from the streamflow, many river wetlands are now almost never filled, leading to a huge loss of biodiversity. Environmental water ensures that birds have somewhere to go for food, nesting and raising their young. "Birds usually breed when there is best chance for their chicks to survive, usually when there is abundant water and therefore food. "Rainfall and floods boost macroinvertebrate (waterbug) populations and result in plants (such as eucalypts) germinating and flowering. In turn, this feeds frogs and fish which are lunch for many of our larger waterbirds. So, water in wetlands is extremely important for breeding." During widespread droughts, many wetlands across Australia will dry out, limiting the food habitat available for waterbirds to feed and breed. This decline in the availability of wetlands, as both their extent and locations decline, is exacerbated by the extraction of water from the system to meet human needs. "With the onset of climate change and the extreme weather events that is likely to bring, environmental watering is playing a critical role in conserving our bird populations and is likely to be the key to survival in drought." In 2015–16, environmental watering was extremelysuccessful across many regions. 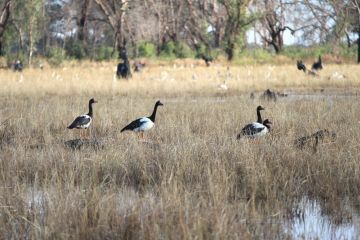 In the Goulburn-Broken wetlands, magpie geese (another threatened species) were recorded at Black Swamp for the first time and at Kinnaird Wetland for only the second time. This prompted Goulburn Broken CMA to ask for environmental water to maintain water levels at Kinnaird Wetland to help the geese feed, roost and breed. Birds also made the most of the wetlands watered in north-central Victoria. Environmental Water Officer with the North Central CMA, Bree Bisset, says, "At Round Lake, most waterbirds recorded at the wetland were deepwater foragers (such as Eurasian coot and black swan). While low numbers of diving and dabbling ducks were recorded, we did observe the blue-billed duck and vulnerable musk duck, both of which are threatened species. "It was a similar story at Lake Elizabeth. The abundance and number of species were lower than previous years but we still recorded around 1,400 birds and 18 different species. Grey teal, black swan and Eurasian coot were particularly abundant. Threatened species (such as freckled duck, Ballion's crake, whiskered tern and Australasian shoveler) were commonly recorded. We also counted 104 sharptailed sandpipers, a species listed under a number of international migratory agreements." 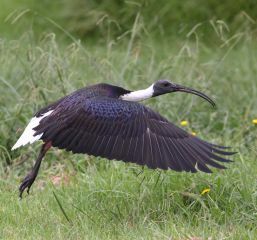 The annual aerial survey of waterbirds in eastern Australia, conducted under the guidance of Professor Richard Kingsford from the University of New South Wales, has shown significant declines over more than 30 years in many waterbird species across eastern Australia and the Murray-Darling Basin – including Australasian shoveler, glossy ibis and straw-necked ibis. The latter was seen in unusually significant numbers in the Wimmera-Mallee wetlands in October 2015, when hundreds were observed at Corack Lake. "Straw-necked ibis are a rare site at this wetland," Amy Russell, Environmental Water Officer at the North Central CMA confirms. "We think they came to the wetland because of a lack of water elsewhere in the landscape. This demonstrates just how important environmental watering can be in north-west Victoria in drier times."